Grandson Asher called one evening to ask a science question. He wanted to know what holds up column of water in a glass of water inverted in a basin of water? I knew the answer would be less than satisfying to Asher. He’s 10 years old and doesn’t know the kinetic theory of gases that ‘explains’ what supports the column of water in the glass. 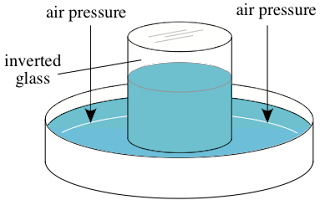 To tell him that one atmosphere of pressure equal to 14 pounds per square inch is pressing on him and the surface of the water in the basin would probably confuse him because he can’t ‘feel’ this pressure. To him, such an explanation would sound like a ‘ghost story’ because I’m asking him to believe in something that he can’t see. I’ve written two posts about the ‘ghosts’ kids are asked to believe in when studying science. Here are the links. 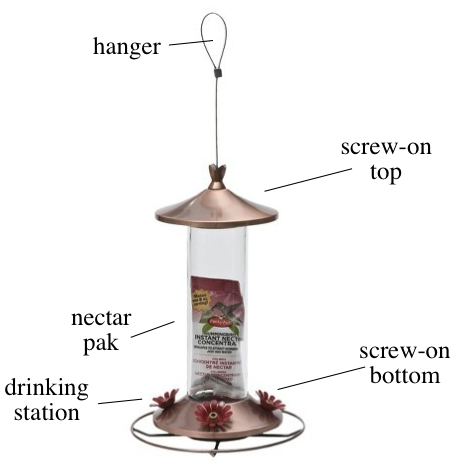 I changed the subject and told Asher about the hummingbird feeder I recently purchased at Target (Perky-Pet Copper Glass Tube Hummingbird Feeder – $14) that uses the inverted-glass-in-a-fluid principle. You do not need to buy the red-colored hummingbird nectar (sugar water) as it’s an unnecessary expense. Besides, the kids will enjoy making the sugar water for the bird to drink. Here’s the recipe for enough sugar water to fill the glass tube in the feeder. Stir the sugar into the water and heat until it begins to boil. Let cool. Do not add red food coloring as the red dye is harmful to the birds. 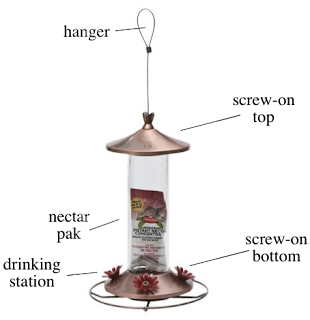 We hung the feeder on the patio and within a day or two we were thrilled to see a hummingbird drinking at the feeder. I have a $100 digital camera so I cannot take great videos or stills of the birds at the feeder. I envy those of you that have better equipment because you could capture the birds in much greater detail. Click on this Youtube video to see a hummingbird at our feeder. For several days we were convinced that the same bird was visiting the feeder. The bird would never sit on the circular perch that surrounds the feeding stations. It would hover about six inches from the feeder, dart in for a quick drink, hover, dart in, hover, dart in, until it had its fill. Until one day we observed a hummingbird perched at a drinking station drinking its fill. We knew at least two birds were visiting the feeder. We thought we could use coloration to identify specific birds but so far there isn’t enough variation in color to distinguish between the birds. Hummingbirds are not very social. As we observed the two birds, the hovering bird and the perching bird, we saw that they would not drink together. They would fuss over which one was going to drink. to start is the Smithsonian National Zoo web site. Here’s the link. Observation is perhaps the least practiced of the science process skills. Encourage kids to regularly observe the feeder and to keep a Log of their observations. They could record the Date, Time, Weather, and an Observation. The Observation could include, coloration, size, and behavior such as the bird's ability to fly backwards. They could run a strip of masking tape along the long axis of the glass tube, calibrate the glass tube in milliliters, and track the amount of sugar water the birds drink over a day, a week, a month. We have had much more than $14 worth of pleasure watching the hummingbirds. You can even sit in a chair within a few feet of the feeder and the birds will drink as long as you remain still.